Roger Federer of Switzerland hits a forehand against Devin Britton of the United States during the US Open at the Billie Jean King USTA National Tennis Center on Monday, Aug. 31, 2009, in Flushing Meadows, New York. Tennis returns to New York once again with the U.S. Open. While some of the tournament’s first round matches have already been played, don’t panic. You haven’t missed anything yet; the good matches will occur in the later rounds. On the men’s side, the question is whether anybody can defeat the No. 1-ranked player in the world, Roger Federer. On the women’s side, the question is whether anybody not named Williams can win the U.S. Open. Be sure to keep your eyes on Roger Federer; he is one of the greatest tennis players to ever play the game. A lot of people don’t want to admit it, but he is the Michael Jordan of tennis. Federer’s stats are simply amazing. He is 28 years old, and he is working on winning his sixth-straight U.S. Open. His streak of winning matches is up to 35 straight, and it does not look like he will be slowing down anytime soon. 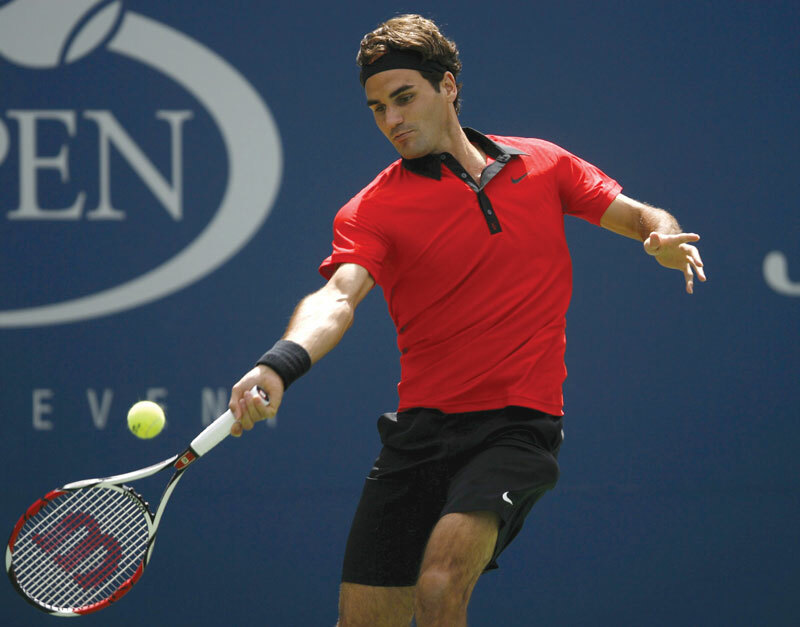 Federer has won a total of 15 major titles, and at one time held the No. 1 ranking for 237 consecutive weeks. He is a quiet legend, but because of his humble demeanor, he is not given a ton of credit. He seems unbeatable, but there are some players that could knock him off – starting with Spaniard Rafael Nadal. Nadal is one of the most fun players to watch in all of tennis. The guy enters the arena like a heavyweight champ, and runs onto the court like a track star. Fans will hope he stays alive long enough to face Federer. Who can forget the amazing matches Nadal and Federer have had over the last few years? People have called their matches some of the greatest of all time. Sadly, Nadal is not feeling like his normal self — he is not fully recovered from the knee injury that kept him out of Wimbeldon. If they do meet at the U.S. Open, I don’t think that the match will be one to remember, because of Nadal’s lingering injury. The next man that could beat Federer is Andy Roddick. He is the popular American player — and this is the guy who was supposed be the MJ of tennis, but that hasn’t panned out. Roddick has one of the fastest serves in the game, one time reaching up to 155 mph, but his all-around game is not on Federer’s level. However, he does deserve credit for having pushed Federer to the limit in their epic final match at Wimbeldon. That match went five sets — so perhaps Roddick could be the man to take down the king. If Federer is Michael Jordan then the Williams sisters are Kobe Bryant. They have to go down as the greatest sibling pair in any sport. The sisters don’t always show up at every event, but when it is time for the bigger events they are ready. Their track record is amazing for the major events. Serena Williams has 11 major titles and Venus Williams has seven. They have also excelled in doubles, winning 15 titles as a doubles team. However, Venus Williams looks vulnerable — she suffered an injury in her first round match Monday, and that could affect her later on. She won the match, but it took her three sets. The injury to Venus makes Serena the clear favorite to win it all, but she may have one challenger: Maria Sharapova. Sharapova is beginning to get back into shape after having a shoulder injury plague her in 2008. Though she is no Serena Williams, Sharapova has beaten Williams before. I would mention Dinara Safina, who is number one in the world, but she has never won a major title. She struggles with pressure, and no one is really afraid of her. This U.S. Open has a lot of intriguing stories – be sure to tune in.